Smart Factories - Turck Banner solutions for Industry 4.0. Most manufacturing companies are constantly balancing the desire to improve production against the return on the investment required to achieve that improvement. Industry 4.0 has the promise of facilitating great improvements. However, as with many emerging technologies, there is a shortage of expertise and experience. Most companies have the skills to install sensors and use the outputs to trigger the next step in production. Many also have the ability to collect all the data from all the sensors and store it for later use. Very few companies have either the expertise to effectively analyse the data and produce useful results or the experience to know what can be realistically achieved from the results. Turck Banner, as a major sensor manufacturer is frequently asked to provide the complete solution, not just the sensors. They can achieve this in two ways. Turck Banner have invested heavily in its systems division to have in-house expertise in middleware development and have their own secure cloud storage facilities. They also have specialist integrator partners like Smart Factory who have a proven history in delivering turnkey projects which exceed customer expectations. Smart Factory is based in the Nexus Innovation Centre at the University of Limerick. Brendan Sheppard B.Eng CEO has over 20 years’ industry experience, and is the driving force behind the Smart Factory. Throughout his engineering career, Brendan has worked with many leading multi-nationals, such as Proctor & Gamble, Accantia, Tambrands and Boeing. His commitment to continuous process improvements, lean manufacturing environments, data capturing and reporting was the foundation for the vision behind Smart Factory. 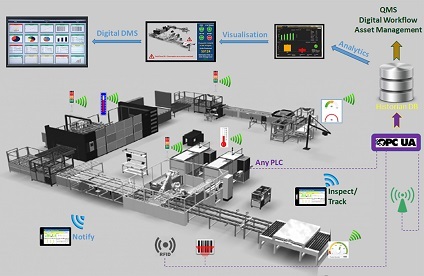 The SmartFactory Solution is a non-invasive retrofit system that captures process data in real-time, giving actionable intelligence to optimise operational performance. Their team have developed a robust and well-engineered solution that combines Industry 4.0 and lean digitalisation, driving efficiency through innovation and bridging the IT/OT convergence in manufacturing. Even at this early stage, this new technology has seen a very positive market response, capturing, analysing and visualising key performance indicators from the manufacturing, logistics and utility sectors, using smart Industry 4.0 technology. Whenever a customer approaches Turck Banner for a solution they know that they will be guided from start to finish using the best possible resources, both in-house and through partners, to achieve the required improvements and return on investment.